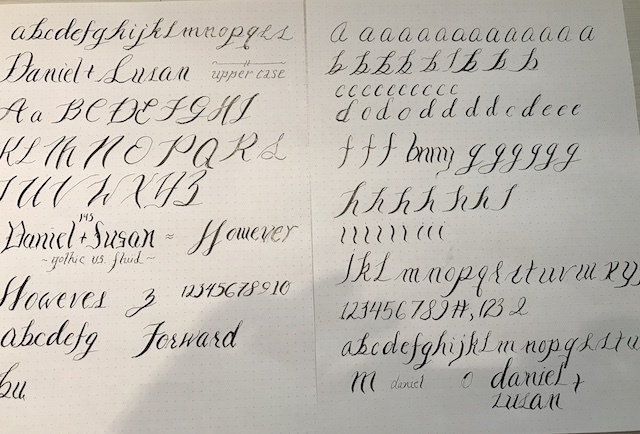 We did a calligraphy class today, and I feel an obsession coming on. Typography, calligraphy, writing utensils—these are pure beauty to me. This was a short beginner course, and we’re going to sign up for the intermediate one as well, which covers things like building your own “font”, using digital tools like Adobe Procreate to practice, etc. It’s also extraordinarily relaxing to do calligraphy. Really enjoyed it. 13/10. Would recommend. The class we took was from Quick Brown Fox Calligraphy in San Francisco, and I highly recommend them. The teacher was super knowledgable, not just on calligraphy itself but on how to get better at it, develop your own brand, and how to make money doing it.